Ketamine, Coffee, Food, Family and Student Doctors! Ah Ketamine. I just love it! Its been two weeks since my trip to Adelaide for my three day infusion. It was a great trip. I went with my second family, Steff, Phil and Amity. It was a great trip even if I did sleep for most of it. We travelled to Adelaide on the Monday afternoon and arrived in time for dinner and had the best Indian food I have ever had from my fave Restaurant Raj on Taj in King William Rd. I have not eaten there in years and it was divine. The next day I had my first day of infusions and I pretty much slept through the whole three days. It went really quickly. Basically my whole trip went much like this… Ketamine, Coffee, Food, Family and Student Doctors! The weather during this trip was Hot, rainy and humid. It was a shocker and it did raise my pain for the first few days, but by the end of the three days I was feeling good and my pain was at an all time low. It was so nice. Steff even noticed how my presence changed as I came out of the pain. Each morning I was driven to the hospital by Phil who then returned to pick me up that afternoon. The staff in the pain clinic naturally thought that Phil was my Dad and I soon realised that there was no point correcting them. Having fasted each morning and being in need of a good coffee, I introduced Phil to my fave café, Cibo on Rundle St and I got him hooked. Each day we would grab a latte and I would spoil myself with a yummy pastry. If I move to Adelaide I’m scared that I’ll be the size of a house because I love the pastries so much. Yum! After my infusion we would normally relax before going out for dinner and eating fantastic food and I even snuck in a glass of wine when I felt the need. Not sure if that was a good choice but one couldn’t hurt. Lol. Aside from all the food, two really exciting things happened while I was having my infusions. The first thing being that I got to speak to student doctors about CRPS! On two of the mornings I was asked if I was interested in having a chat with some fifth year student doctors. I was really excited to be able to make around fifteen future doctors aware of CRPS. The average diagnosis of CRPS is made after four years of suffering and most doctors never see or diagnose CPRS so I knew that this was a great opportunity. The students were equally excited to chat about my experience and treatment as well. I decided to be really open with them and the students on the second day really got into my story. It was a smaller group and we were chatting for near an hour and made my infusion run way over. I didn’t mind though. I hope I can have the opportunity to do it again. Hopefully someone will benefit from my sharing my story. 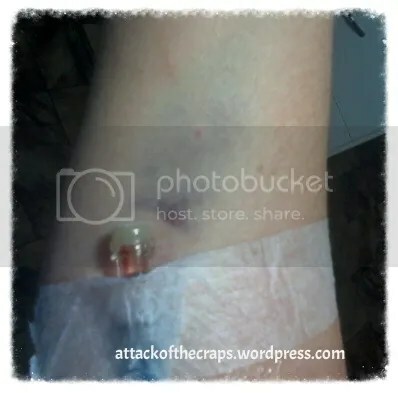 On the last day of my infusion, I was in recovery and chatting with a nurse about the mental strain that CRPS puts of you when she asked if I had seen anyone like a psychologist. I told her about the lack of care I had received from being in a rural area. The next thing I know she is off to ask the clinic psychologist if she could see me while I was in town. The next day she fit me in and it was great. We basically started by chatting about what has happened so far, who I am and how I am coping. Her main concern so far is my lack of sleep and how it is affecting me. I have started on Melaton and will be doing a three month trial to see if it helps. I will now do a phone session every three weeks and meet at the clinic when I have appointments at the hospital. 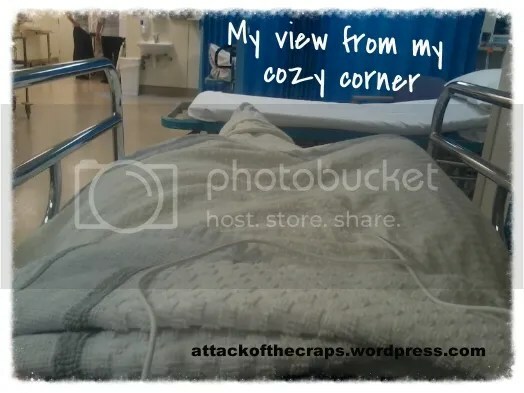 Mostly I’m hoping that I’ll be able to improve my outlook on life and living with CRPS. Already Im looking at what I could be doing to move forwards and not make CRPS my main focus in life. It can’t own me but I have been a little stuck trying to sort it all out on my own. Things are looking up! Ketamine: Only One Week To Go! Im sorry for being such a bad blogger, but having CRPS in my left hand and symptoms in the right I feel that I have a pretty good excuse for not wanting to be typing too much. I do think about it and sometimes I even start typing but the pain is too much and I have to stop. The one thing I hate about the infusion cycle is when is stops working and the pain comes back. Lucky for me Ive only been struggling for the past week or two. Last time it was more like 6 weeks before the next round and it was hell. I only have a week until my next infusion and I cant wait. The thing about the Ketamine wearing off is that it shocks me at how much the disease progresses underneath the numbing effect of the infusions and then BAM it hits you hard. But Im still lucky because I get lowered pain in between infusions and each one is improving for me. I love my infusions and once the needle is in my vein Im happy. I really hate having the IV put in. Im fine with blood tests though. Go figure! This time around Im hoping that the shocking fatigue will leave me and Ill be able to do more. It takes me days to get over anything eventful and Im finding it hard to do much at all at the moment. Even sitting up to get out of bed is hard for me at the moment. I really cant wait for next week. Im going to Adelaide with my “adopted” parents, Steff and Phil. Plus my little Sis, Amity is staying with us for a few nights. I will have my infusions from Tuesday through to Thursday and they will be my “responsible person”. Then Thursday night we will head out to Gawler to stay with Amity, before heading home on Friday. Im also hoping that Ill get to see my darling bestie Casey while im in town. I really do have to make sure I take it easy though and rest up in the afternoons while Im having the infusions. They are my priority after all. lol. Ok, Ketamine isn’t the “wonder drug” for all, but it is for me and my CRPS. This is how I went with my recent Ketamine infusion. Ketamine does not work for everyone, but it does work for me and this is my story. I’ve had been a little absent recently because I had my second infusion in December. I had it just in time for Xmas and our current summer. Living by the beach, it would have been such a shame to miss out on days at the beach, a healthy soak in the ocean that I use as a substitute to epsom baths and Hydrotherapy. I was worried for my veggie garden if I was not able to be fitted in for an infusion until after summer. There was no way that I could have one in January, as its holiday season here by the coast and while I would be ready to go, no one would be able to come with me as my “responsible person”. It just had to be before Xmas! I was thrilled to get the letter a month out. It came on a day where I was in a great deal of pain and it was like winning the lottery. I was so grateful for being fitted in. I know my pain Dr did me a huge favour and it was a wonderful Xmas present. I had my infusion 4 months after my last one and it was just way too long. The last month was pure hell and plunged me into a horrible state of depression. The pain was wearing me down and I was mentally suffering from boredom and fear of what this illness meant for my future. I was in a different state of desperation this time. The last infusion, I needed to put the brakes on the disease from spreading any further and I needed the other neuro symptoms to settle down. This time around it was purely to stop the pain and give me back some sort of life, as I was no longer able to do any physical activities. I was hoping this time to be able to go back to work part time. A year in I am flat broke and the dole just does not pay that well enough to live off of, let alone pay medical costs! So in mid-December I headed off to Adelaide for a three day infusion at the Royal Adelaide Hospital’s Pain Unit. Mum and I stayed at a friend’s place at Murray Bridge, a forty five min drive from the hospital. It gave Mum time to spend with her bestie in the evenings. The infusion was fantastic and gave me a rest… it feels good too. Lol. I love the team at the pain unit. I’m always the first one in and I immediately claimed my fave bed in the corner of the ward. On my first day I had a little issue before the infusion even started and I found that day the hardest. I’m shocking with needles. Since my fainting episode when I was admitted to the burns ward, I have had a tendency to fait. It’s mostly over having an IV inserted. My veins tend to disappear when the needle goes in and it has taken up to four goes before it is in. So I was more than nervous when it was time to insert it on the first day. I was trying to focus on getting it done and starting the infusion. I think that being greeted with “oh, it’s you!” says everything. Lol. At least I made my mark! The nurse decided it was best to get the anaesthetist straight in to get the IV done. So in come a lovely Indian Doctor what immediately put me a little more at ease with his kind manner. Yet, once again my veins disappeared as soon as the needle went in. I was still too tense. The nurse and Dr started talking me through ways to calm me down and eventually this was to follow. Dr: breath in an out slowly, imagine you are at your happy place. Are you there? Dr: where are you now? Me: I’m at the beach. Me: I’m at long beach, back home in Kingston. Dr: ok, who are you with? Me: I’m…..with my horse Ernie….. and the tears start welling!!!! Tears instantly come. Ernie died a year ago and was my happy place and soul mate. He suddenly got sick and died 8 days later. My CRPS took off after the stress of losing him. I’m still mourning him and would give anything to have him back. The poor Dr was so sweet. He instantly stopped while I tried to calm myself down. I guess the stress of the past month, nerves and my realising my happy place was gone was too much. I was a mess. What I didn’t realise was that because he stopped to let me calm down, the needle was still in my arm and I was busily wiping my eyes and unknowingly smacking the needle around in my arm. The bruising that I caused my self was quite impressive. Lol. Once I calmed down, I retried the breathing exercises and the IV went straight in. I felt like such an idiot! I ended up blubbery throughout the whole infusion. I just wanted my boy and my life back. Other than that it all went pretty much to plan. I would come in each morning and was allowed to come earlier if I wanted as I was the first one in and we could start once we were all ready. I got past having the IV put in and I was hooked up to the machine. Suddenly I feel quite drunk and my eyes are blurry. Im given a big dose of Ketamine to start me off and then I settle into the five hour infusion. Basically I go off to sleep and listen to my music. I really enjoy the sleep. The only annoyance being my blood pressure being taken every ten minutes and the pulse thingy on my finger. I often have to swap fingers because they get so tender with the monitor on them. Everything has to go onto my right arm. My three other limbs are out of bounds. I’ve tried the blood pressure wrap on my legs but the cramps that I get and the tightening of the wrap do not get along. Once the infusion is over, Im sat up and given a sandwich and a cup of tea. I then sit there, maybe getting up to go to the toilet, an interesting challenge when you’re so drugged up. Then I sit and wait for Mum to come with a coffee from Cibo on Rundle St. My reward! After I’m released I head off into the sunset/afternoon to have a quiet rest and to be ready for the next day…. Supposedly. Mum was great while I was having my infusions. This was her holiday from the café and she really needed to catch up on some sleep. The staff were happy for her to come in and have a nap in a chair next to my bed and even offered her a bed for a while. Poor mum. Next time I will get a hotel room for the 3 days and take myself in, in the mornings so she can sleep and wander the city until its time to pick me up. She does enjoy the time away and wandering the city. Until I had my burn injury, she rarely came to the city, had never driven in the city and had no idea of how to get around. I think she has found it liberating to find this freedom and adventure. I think it’s great and love seeing her become so independent. The staff were just wonderful. They made sure I had vegetarian food ordered for after the infusion and were more than accommodating to my needs for my CRPS. It’s wonderful to have such a caring team looking after you. It was fantastic going to bed the first night. I had almost no pain. It was a strange feeling, but such a relief. I slept really well. Partly from the infusion, partly because I was relieved and exhausted. In a way my fave part of having the infusion is the fact that I get to sleep, rest and in a way be drugged out and escaping the pain. I wouldn’t want it every day. But just for a few days, it’s like a holiday from the pain. I’m sure this is something that other sufferers would understand. In the after math of the infusion I have done so much better than last time. My last one went like this. The first month after I was very up and down with my pain and slept a lot from what I understand to be an infusion hangover, the second month was pure bliss. My pain averaged a four out of ten and then a little higher at night. The third month it was wearing off and the pain crept back making the fourth month pure hell. This time around I have had my pain instantly reduced. It’s still a little up and down but I’m seeing my condition improve with each week. I had a great Xmas camping at the beach until the New Year. I attempted going back to work, aiming for 2 hrs a day and I got back into my garden. We camp only 20min from home making it easy to come back for work, to look after the animals and for me to tend to my garden. I will say that I did overdo it a little, well a lot, but at least I was able to be involved in the festivities and spend time at the beach. I would say that the CRPS had progressed substantially since my first one and Im still only able to be active in small bursts followed by big rests. I’m still achy and in pain but I can function and participate in what life I currently have. I know I am lucky because it doesn’t work for everyone. It isn’t a miracle cure and despite my expectations it does not take all of your pain. It’s funny how you forget how you went last time. I kept a diary of how I went and looking back I was still in pain and yet part of me had expected me to be pain free and able to get back to normal. Wishful thinking I think. Lol. I’m looking forwards to continued improvement and my next one. I know that it takes an average of 3 infusions for it to take full effect and I can’t wait to get my third over and done with so I can hopefully function a little better and get on with my new life. Study and a little work would be fantastic.